The Growing Nations team comprises a remarkable group of full time Basotho staff members who are supported by voluntary workers & consultants from Lesotho and around the world, including the UK, USA, Netherlands & South Africa. Growing Nations is fully committed to the training, equipping and empowering the local Basotho staff team with the aim that they will take over the full running of the project, allowing the non Basotho volunteers to step back from their roles. Growing Nations comprises of two trusts formed by the Kereke ea Evangeli Lesotho (KEL) or Lesotho Evangelical Church in Southern Africa (LECSA). 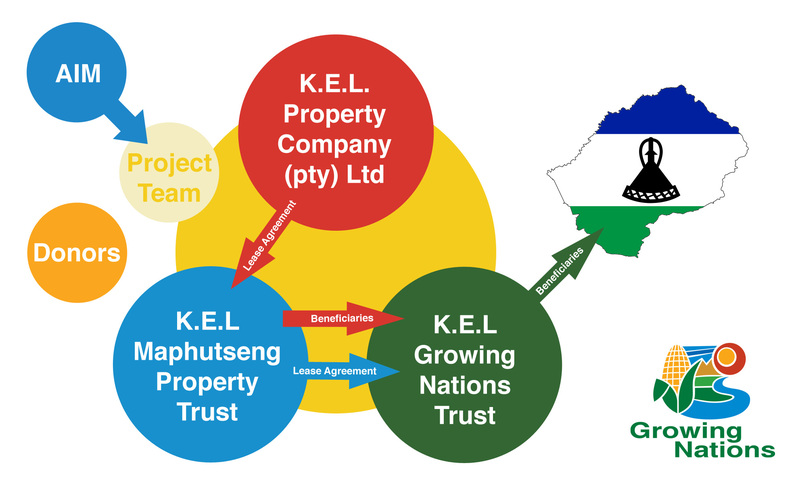 The two Growing Nations operating trusts are the KEL Growing Nations Trust which is responsible for the running of the Growing Nations Project and KEL Maphutseng Property Trust, which is responsible for the management and development of the land and infrastructure at Maphutseng. All the land & buildings at Maphutseng are leased to the the KEL Maphutseng Property Trust by the KEL Property Company (pty) Ltd. The structure of these trusts is as follows. Both Trusts are made up of a board of Trustees who represent the various different bodies who have an interest in the running of Growing Nations. These include the LECSA, the Maphutseng Community, the Donor Community, the Growing Nations team and Africa Inland Mission, who has missionaries working on the team. Growing Nations is based on the site of the historical Bethesda Mission Station, in the Maphutseng Valley, near Mohale's Hoek in Lesotho. The site includes the Demonstration Farm which is used for training the students in our Resident Student Program and is where farmers come to see what can be achieved with Farming God's Way Conservation Agriculture methods. The demo farm is is also where research into Conservation Agriculture is carried out in conjunction with our partners. In addition to the work at Maphutseng, Growing Nations also carry out extension work teaching farmers how to farm using Farming God's Way methods in their own villages. This work is principally carried out in the Mohale's Hoek region but Growing Nations also work extensively with lead farmers across Lesotho and more widely across Southern Africa. Growing Nations also welcomes visitors from all over the world to Maphutseng to receive training to enable them to teach others across Africa. Much work has been carried out on the infrastructure at Maphutseng since Growing Nations moved to the site in 2008. This has included the renovation of many of the historic structures which formed part of the original Bethesda Mission at Maphutseng. More details about the history of the site at Maphutseng will be added shortly.